Me, Mia, and Becky - my new gardening pal's! 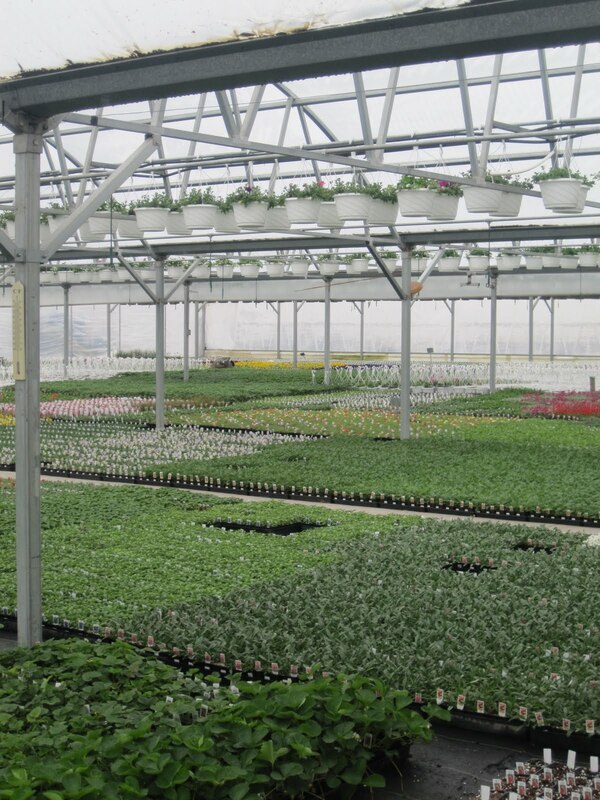 On a cold, blistery day in March I got to spend the whole day in a full blown, bona fide, Nursery & Garden Center. It was completely fun, and worth the two hour drive. The day started out touring the major facility. After our grand tour it was time to get to work. 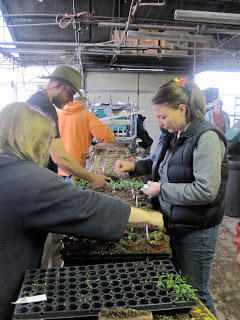 We volunteered by getting the seeds started and transplanting the plants that had already grown a few inches. I met some wonderful people and just enjoyed the day getting my hands dirty and learning how to start seeds for growth. I know, I know you would think it would be super simple just to put seeds in a tray of soil and let them do their work. Because I am a beginner gardner I had no idea that it just took placing the seeds on the top of the soil then lightly topping off the seeds with a little bit more soil. No wonder the seeds I tried starting last year never worked...I stuffed them so far down in the soil they never really had a chance. However, I started some of my own seeds again this year for my garden. It just so happens that this year, by following the techniques learned during my observance and volunteering at the Nursery my little peppers have germinated and are ready for planting. 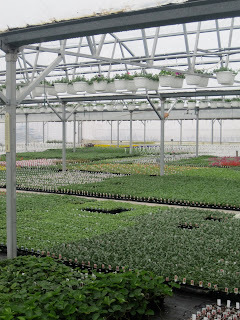 I had such a wonderful journey through the many greenhouses, and walked away learning some great skills. Of course, I am now just one step closer to a green thumb! The seed planting machine. Feeds the tray of soil through a machine that then places the seeds on top of soil. When sent through the machine the person, me, then made sure one seed got placed per thimble size container. 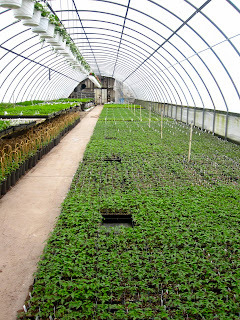 When seeds were throughly placed then the seeds were slightly covered with more soil and placed in greenhouse. 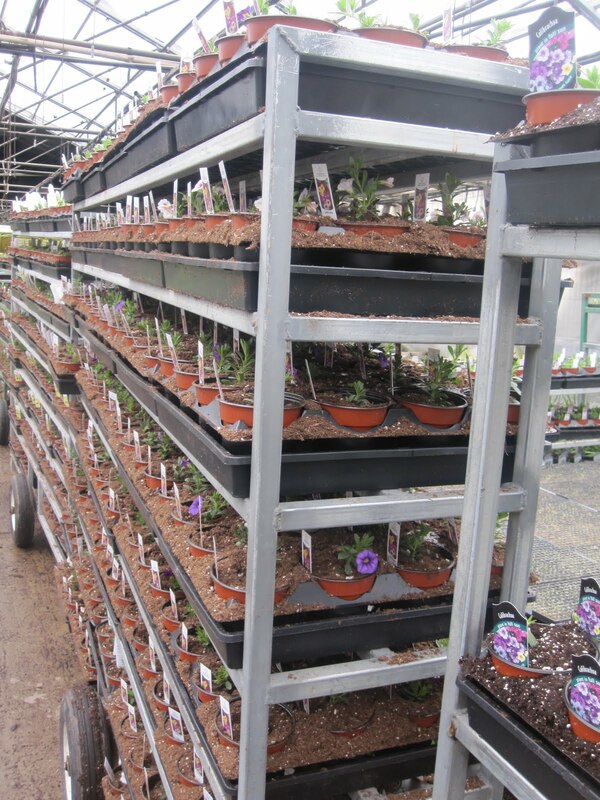 Another fun machine used for transplanting the smaller plants into bigger trays for selling of plants. 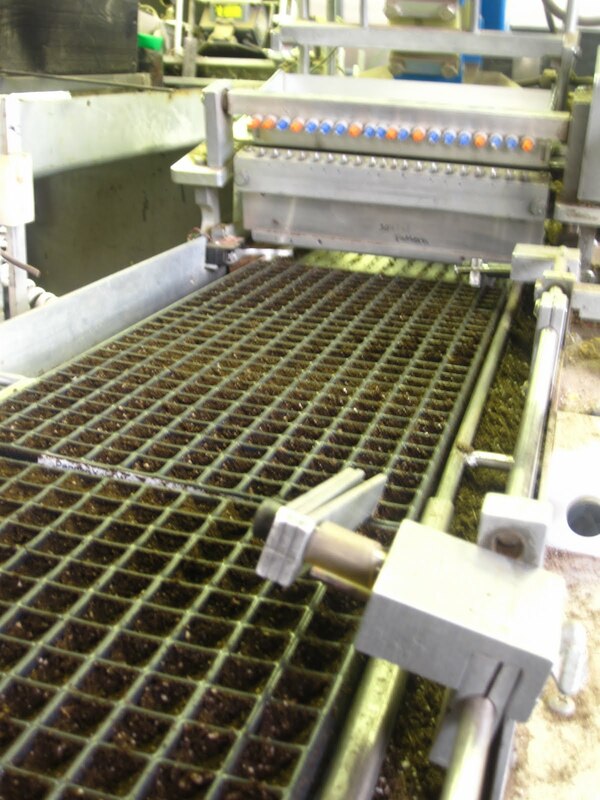 You place the tray of plants underneath the contraption then push down and the poker like things pull out the plant so they can be transplanted. Everyone working hard and having fun. Seriously, the time just flew by!!! Pots planted, now it's off to find them a home in the greenhouse! 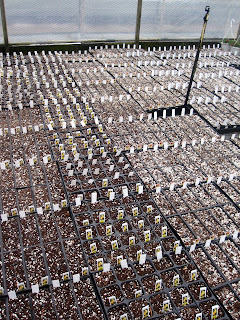 Seeds, seeds, and more seeds starting their germination. I could just live in a place like this! I had the most fun just wondering through the never ending greenhouses. Peaceful and serene. Leaving the greenhouse, hoping I can come again soon!!! I love the spring time! It's still a little chilly out, and we are still getting snow here. However, even though summer is trying to find it's way to town we can still plant some pansies. Pansies love the colder weather and even love the snow...a little. I got me some pretty purple pansies about a month ago and have enjoyed watching them grow in this cold spring weather. The word pansy is such a weird name. I actually love it when someone calls me a "Pansy" in a derogatory way. I am always like, "You want to call me a Pansy? Well thank you for thinking of me as a cute little flower!" That's how I look at. Before I got into gardening I got me some pansies toward the middle of the summer. They weren't the best looking pansies, but I thought with some extra help and green thumb caring I would bring these pansies back to life. That was not the case. They struggled, looked sad, and pretty much went to flower heaven. I later came to find out that I hadn't done anything wrong in my taking care of my little pansies. Pansies just don't like the heat, so they gave up their battle to live last summer. That's the joy of annuals. Ha! Now I know that pretty little pansies like the colder air, and it gives me something to enjoy until the hotter weather makes an appearance. If it's still cold in your neck of the woods go out to your local nursery and buy yourself some Pansies - they will brighten up your cold spring day, and keep your garden looking pretty until the hot summer months come about. I recently have been volunteering my time to teaching Beginning Gardening Classes to people in Iron County. The classes had about 25-30 students in attendance. Out of six classes being taught I taught three of them. I did a class on Starting Seeds vs. Buying Seeds, another on Vegetable Gardening, and my last class was on Ways to Water and Irrigate. I had to do a lot of studying on each subject - because I'm a beginner myself. However, I felt that I had studied enough and was well prepared that I ended up being confident enough to teach. I enjoyed teaching these classes, and as an added bonus I even learned a lot about gardening myself. I am not an expert at gardening, but I'm making my way to having a very bright green thumb. Spring is HERE, and I'm Not Ready! Spring has finally sprung, and I'm not even close to being ready!!! However, it's been nice that spring in my neck of the woods is still cold and snow covered. 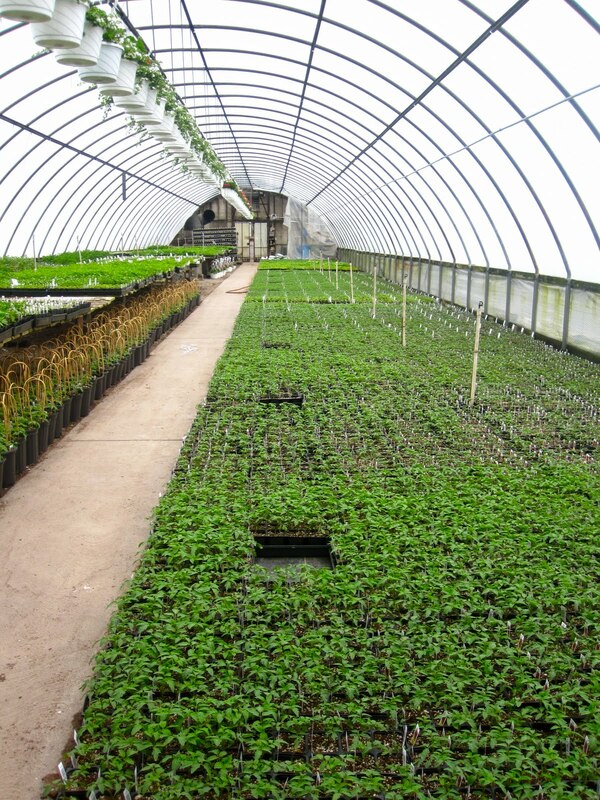 What do I need to get done before it's time to plant all my little seedlings??? (A couple of weeks ago) I finally purchased my seeds. Oh course, it was after deciding on what I was going to grow! I bought me some soil for my seed starts (since my compost wasn't ready to use) - and my brother provided me with containers to start them in. 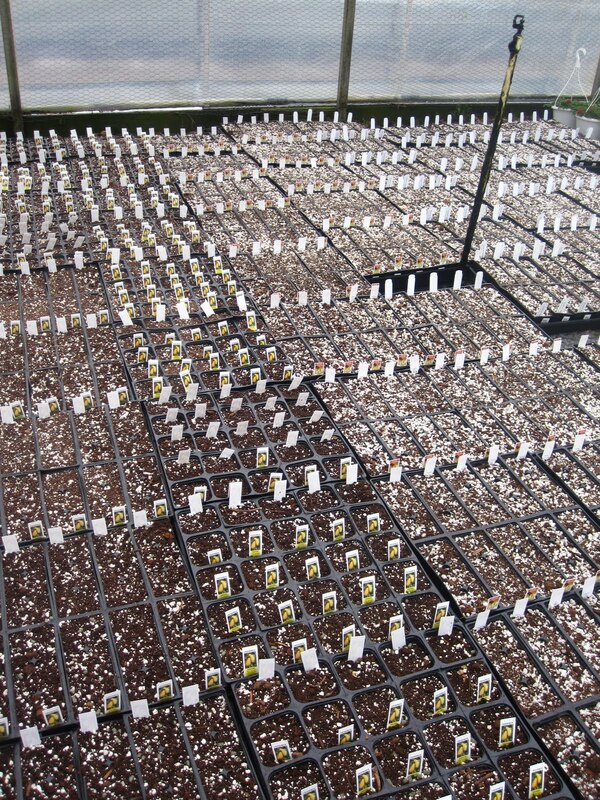 It's time to get my seeds planted so they will be ready to go mid May. The garden spot is in the process of getting a fence put up, so that the doggie won't get in. Need the irrigation water set up so it waters my rows. Pro - Pesticide! Kill the weeds in current garden spot. Sprinkle compost over garden area and till it in. I think that is all I need to do. Now I need to get with the program and get going. Where does the time go? It's even time to get those cold weather veggies planted and my garden isn't even ready. How am I ever going to have a green thumb if I keep up this procrastination - Yikes! Beginning Gardening Class - And I GET to Teach! As I hopefully get to hold the title of being a Master Gardner part of my certification is to give forty hours of community service in the field of gardening. I was VERY quick to sign up and get my volunteer hours in, but didn't realize what I had signed up for. I have signed up for three different beginning garden classes held in the community. I thought I just had to show up and help hand out papers and usher people. Not so. I soon found out that I, with three other soon to be Master Gardner's would be teaching. Holy FREAK. Well, I finally scheduled a time and met with my two other partners. We spent two hours discussing the topic of what we would be teaching. This is the first class of six to be taught in my area, I have been given the topic of "Why do people plant a garden?" Why am I choosing to garden? Probably the same reason most other people choose to garden. Religious reasons - my church pushes being self reliant and having a garden. It's the hot thing to do right now - even Mrs. Obama is into it! My Grandparents did it, my Parents do it, I should do it! Everyone is doing it, so why not join the crowd! Now that I have chosen to join the crowd and garden, the next question is, what do I grow? Now as the months are inching their way to spring and summer I better start watching the local weather. The most important thing for a Gardner to have, and own, is a thermometer. Lastly, making a conscious effort to watch the news for the weather details. I guess I better get buying me a good thermometer, and check the weather each day as part of my daily routine. Oh my, that thumb of mine is on it's way to turning green. Two years ago I started a job working as a ground keeper for the University I am currently attending. I was told about the opening summer position and made a quick rush to apply for the job. I went through the normal procedure to have an interview, and then wait. I am not a patient person, but also feel that when you want a job bad enough you need to let your future employer know. That is what I did. I started to make phone calls and appearances to the "Grounds" department. Soon enough they saw my desire to be a groundskeeper and hired me for the summer months. As my job began I quickly fell in love with working in the dirt and planting flowers. I soaked up everything my boss knows about gardening. I have continued my education and love for gardening by being accepted into the Master Gardening program. I am currently working on my certification, and am excited to have the certificate that tells me I am a Master Gardener. Don't you worry, I've still got a long way to go to get that perfect green thumb, but for now, it's showing some color and starting to turn light shade of green. I'm just a girl who is obsessed with salad spinners, Haribo gummy candy, argyle shirts, Netflix, Activia, the state of Kentucky, looking for a blue eyed lover to call my hubby for eternity - or a really long time! Bragging about the teaching degree I have, but refusing to teach home economics, traveling the globe, reading some good books, eating the best food ever, surrounding myself with nice, positive, and pleasant people, laughing so hard my stomach hurts, pursuing a life of a flight attendant - which I am doing now, and just trying to be happy as a clam until I conquer it all! Digging in the Dirt Again! Ethereal theme. Theme images by tolgakolcak. Powered by Blogger.